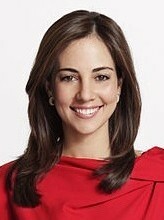 Mariana Atencio is a Peabody Award-winning journalist, currently an Anchor on Fusion and Univision Networks. The Huffington Post called her ‘our Latina Christiane Amanpour’ and Jorge Ramos wrote: ‘Mariana is the next-gen voice for Latinos breaking all barriers.’ Mariana is known for combining in-studio work and high profile interviews like Pope Francis with tenacious field reporting all over the world. Born and raised in Venezuela, Mariana has used her platforms in the United States to shed light on her native country. She’s covered every presidential election and major event from the ground in Venezuela, anchoring #SOSVenezuela about Leopoldo Lopez’s imprisonement and ‘PRESSured’ a one-hour documentary on press freedom, for which she won a Gracie Award.